White-Rodgers ComfortPlus 60 watt Single Lamp Germicidal Ultra Violet System. Designed to help disinfect the internal surfaces of heating, ventilation, and air conditioning systems. Bacteria and viruses that are in the air stream that passes through the system will be reduced. Reduces or prevents mold growth on HVAC coils, allowing them to operate at peak efficiency. Additionally, the UV system greatly reduces bacteria, viruses, fungi, and yeasts. Includes the metal power box, one bulb, power cord and 4 sheet metal mounting screws. Complete and ready to install and operate. Metal case measures 7 x 11¼ x 2 inch. Power cord is 120v, 18 gauge, 72 inch length. Bulb protudes 15 inches from case. The UV100 bulb provides a powerfull 60 watts of air purification (compare to Honeywell systems that use an 18 or 36 watt bulb). 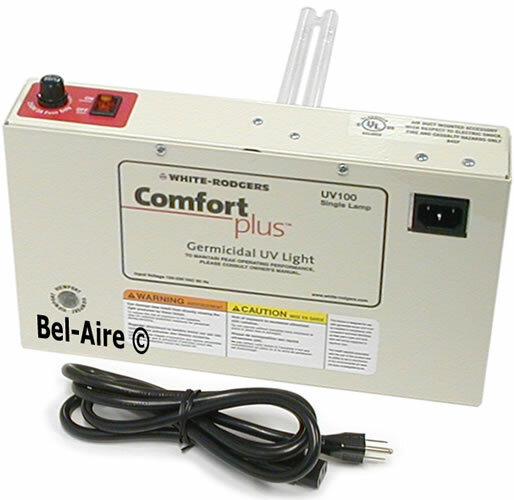 The White-Rodgers UV Light is a remarkably effective means of arresting bacterial growth. The unit emits a germicidal ultraviolet frequency that penetrates the cell walls of detrimental microbes, permanently neutralizing any ill effects. Additionally, better health isn't the sole benefit. When mold or similar microbes are reduced, air conditioner efficiency often improves, saving the homeowner on operating costs.